While WestToast's bread and butter is covering the best of California, Oregon, Washington, and Idaho, we often forget that our neighbors to the north also produce fine wine, beer, and spirits of their own. As a departure from our norm, I've decided to throw an additional review into the White Wine Month Hat and cover a little something Josh and I picked up in a recent trip to Vancouver, BC. Oh yeah, Josh and I spent a day in Vancouver recently and a comprehensive review is on its way. It was awesome aside from a confusion about what "debit" means. More to come. British Columbia's Okanagan Valley is perhaps the most up-and-coming wine growing region in the world. Sharing many latitudes with other wine-growing countries, a similar terroir as many Eastern Washington AVAs, and a pocket climate perfect for growing healthy vines has brought wine makers to British Columbia in droves. To date, approximately 95 wineries are operating throughout British Columbia and they're going everything from Chardonnay to Syrah. Our friends at Avalon Wine have much more information on the region if you're interested. Jackson-Triggs is a name you know. It’s a name your friends know. It’s a name that stands for our commitment to crafting the perfect wine for any occasion. And our attention to detail shows. We are Canada’s most awarded winery and have been named “Best Canadian Winery” an unprecedented number of times in both international and domestic competitions. You can feel proud when you serve Jackson-Triggs knowing that no matter the varietal, vintage, or region, you’ll be pouring a premium wine that pairs well with any moment, large or small. I didn't know the name, but I also didn't know what a flashing green traffic light meant. This was a time when my American ignorance was going to result in sinking or swimming, so I picked it up and brought it home with me for future consumption. Said future consumption happened three days later as Alyssa and I decided to make a fennel-inspired macaroni and cheese dish served with grilled sweet Italian chicken sausage. I couldn't think of a better dish to pop a bottle of good white wine with, so we screwed the cap off of this bad boy and took some notes. This Sauvignon Blanc holds up literally to its name as it pours a very light hue. A lightly sweet aroma is immediately noticeable with what I picked up as hues of melon and green apple. Jackson Triggs' tasting notes are a bit different than what I picked up, but you can decide for yourself. Upon first sip, I was very surprised as the mouthfeel is incredibly smooth and covers your whole palate. You're not at all met with an initial tanginess as you are with some whites and the feeling allows you to taste the entire wine without having put put forth any effort. The taste itself is similar to what you get off the nose, but a bit more floral and toned down in the green apple department. Alyssa was even on board with this one after commenting, "I normally don't like whites, but I really like this one. Very refreshing" That's quite an endorsement! All in all, this is a solid Sauvignon Blanc that should appease almost any wine fan. I don't foresee it redefining what the world sees as a quintessential Sauvignon Blanc, but I definitely see itself carving out a large segment of the mid-range white wine market. If you're looking for a solid Sauvignon Blanc at a moderate price, you can't go wrong with this one. Kudos, Okanagan Valley. I first met Bill Collins thanks to a fellow Arizona State University alum. The Seattle ASU Alumni Chapter held a social at Columbia Winery to allow Sun Devils to mingle and try out a few of their Washington wines. That gray and drizzling day Bill talked me into joining BJ Bryan as a winery member. 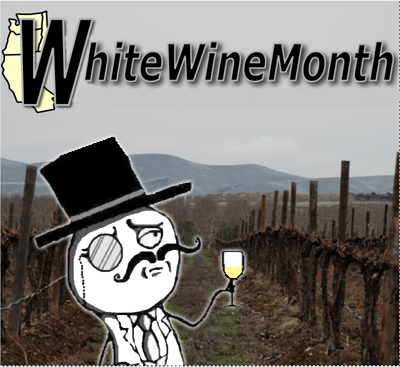 Don’t get me wrong, I enjoyed the wines, but if Bill hadn’t been there I wouldn’t have signed up, and would have a very different White Wine Month post for you today. I recently realized that I need to do a better job of taking white wine notes. I don’t drink it as often as I do red so when we started talking about doing this series, I knew I didn’t have anything in my back pocket to rely on. I started my search by emailing a few wineries to see if they had anything new or promotional they wanted reviewed. No luck. With my submission deadline approaching I jumped in my car last week and cruised around the North end of Lake Washington to see if Bill could help save the day. Wearing yoga pants and with my hair pulled back and starting to curl from the spring downpour that started during my drive, I rushed into Columbia hoping that he was at work. I was in luck. I smiled widely as he greeted me warmly when I walked in. A little stressed about finding something I quickly rattled off what I was looking for: Something red drinkers can handle, under $25, a great summer taste and not too sweet. Bill started pulling out bottles to meet my needs and calm me down. He started with two options. All of a sudden he’s got two more glasses in front of me. At his advice, I’m alternating sips between the two to compare and loving the clean taste of the UnOaked when he pulls out yet one more. The smell of the Gewurztraminer made me feel like I was in a meadow full of blooming wildflowers (think Twilight, but without Bella and a vampire) and the taste of a liquid honey rolled over my taste buds. Despite that description it isn’t too sweet to finish a glass after dinner with some soft cheese as a delicious dessert. 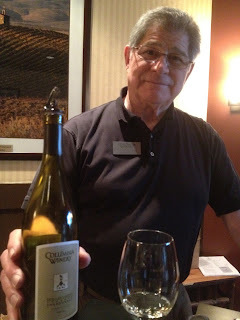 I tasted some more UnOaked and then told Bill I was going to take home my first choices, the Rose & Viognier, but really the entire selection of whites that Columbia has to offer would be great for your dinner table, party or summer patio. Columbia’s website doesn’t currently have tasting notes up on the 2010 Viognier but its 2006 was “fermented and aged in neutral oak barrels for four months” and has an alcohol content of 13.5% with a total acidity of 5.8 g/L. 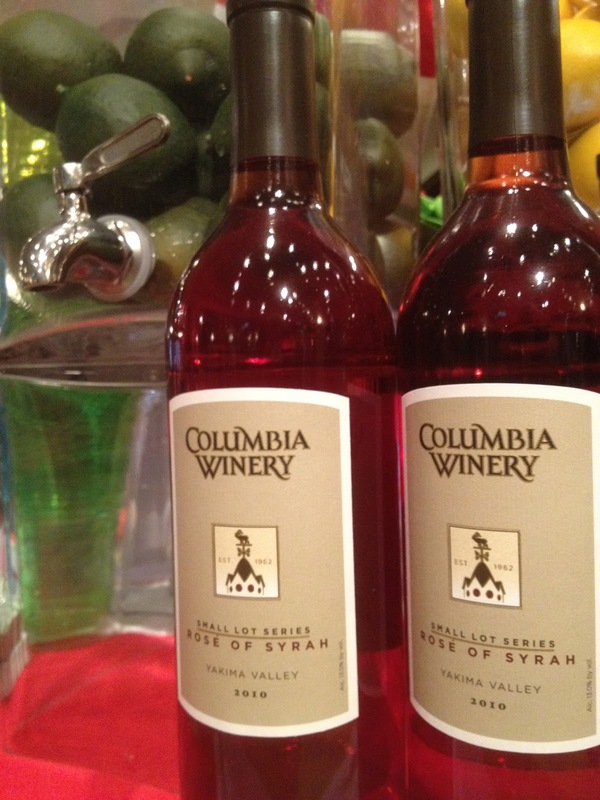 The 2010 Rose of Syrah has a varietal combination of 95% Syrah with 5% Barbera grapes from the Columbia Valley’s Oasis and Millbrandt Northridge vineyards. There is 12.98% alcohol content and a total acidity of 5.6 g/LGrapes were harvested in October 2010 and the wine was released nearly a year ago in May 2011. Unfortunately for those of you outside of the Seattle area, these wines are only available for sale and tasting at Columbia’s tasting room, Fortunately for those of you in the area - the Viognier is Wine of the Month during White Wine Month and you can get the bottle (normally $26) for just $18.20 right now. Columbia’s tasting sheet describes the Viognier as: “On the nose are aromas of lemon, citrus and honeysuckle, followed by hits of tasted oak. The crisp acidity on the front of the palate is followed by undertones of creamy, slightly toasted oak. This wine is light and easy to drink, as well as refreshing and well-balanced.” It recommends a Cobb salad or creamy Risotto dish to go with this wine. As for the Rose: “Aromas of fresh cut roses, strawberries, pomegranates and blood oranges come through followed by hints of Bartlett pear, green apple and mint tea in the background. On the palate are flavors of rose petals, potpourri, red berry and hints of mineral.” It recommends sushi, crab cakes or most soft cheeses though suggests this wine is just fine on its own. You can get a bottle for just $20 (or $16 for Cellar Club members). As the mercury rises and we head toward summer, consider one of Columbia’s whites when you look for a cork to pop. While the Viognier and Rose I mention above aren’t available in stores, their chardonnay is. To get the royal treatment, head out to the Woodinville tasting room to meet Bill and sign up to be a Cellar Club member. Tell him Andrea sent you and he’ll take good care of you. 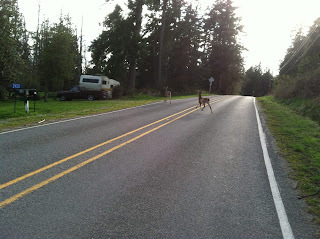 Earlier on during White Wine Month I spent some time on vacation on Whidbey Island in Washington. Though I used to live in WA, I'd never really spent much time out and about among the islands and the Olympic Peninsula, so I was glad to get an invite to an Easter gathering at a beach house in Freeland. The weather was spectacular, in that it was not cold or rainy. I marvel at how this desert dweller has shifted in her view on what makes weather lovely. That said, it was a prime opportunity to do some exploring on bicycle. 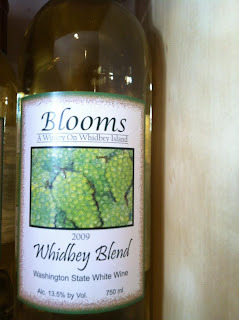 We hit up Blooms Winery/Vineyard in Freeland on one of our cycling excursions. Excited about doing some wine tasting, I was equally pleased to see that they were hosting some live music to round out a Sunday afternoon. Though we did get some amused looks from patrons when we trekked in with our bike gear on, the greeting from our hosts was warm and welcoming. The tasting room was a lovely space, and the guitarist playing was spectacular. The ambiance made way for some wonderful wines. We tried some remarkable reds - the Blooms Poetry and Blooms Syrah in particular, but, this being white wine month, I am going to highlight one of the whites I tried that was truly wonderful. 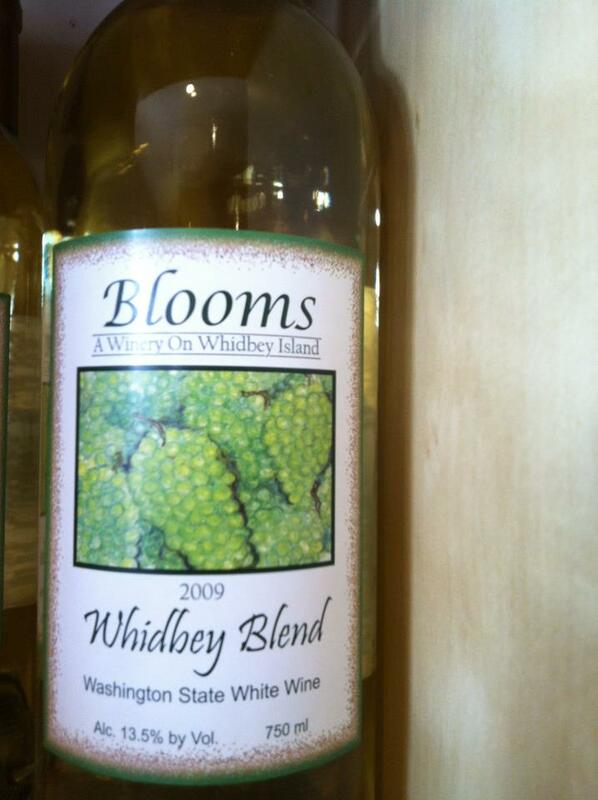 The Blooms Whidbey Blend 2009 comes from grapes grown right on Whidbey (you know me and keepin' it local - all over it). Rich in the nose with grapefruit and floral notes, I found it to be remarkably crisp with a wonderfully balances flavor. I found grapefruit as well as guava early on, tapering into a barely there sweetness and floral sensibility that hinted of clover and violets. This is a fantastic wine for drinking alone, but it could easily be put with a summer grill of chicken, shrimp, or fish to make an incredible meal. 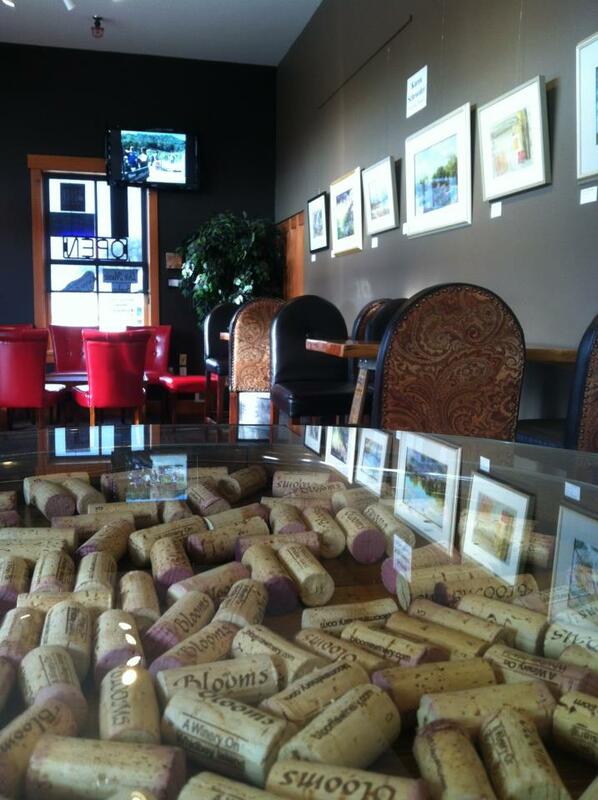 We appreciated the hospitality and the wine at Blooms, and I will certainly be hitting them up again. The tasting made for a fun and refreshing pit stop en route to...wait for it...more cycling (what else???). I can recall when I started drinking wine I fell into the same trap that many do and have a very narrow portfolio of wines you'll drink. For me, it was only red wine. In fact, I was recently in a tasting room and heard multiple people pass on the first couple tastes, citing “No thanks, I don’t like white wine.” When I began venturing in to white wine my palate was all about the buttery, creamy Chardonnay that California has, for better or worse, become known for. Over time my appreciation for white wine has increased and I couldn’t be more thankful, especially when I get to open a bottle like the 2010 MRV from Two Shepherds Vineyards. It was difficult to choose a wine to profile for White Wine Month but I have been so impressed with Two Shepherds that I wanted to make sure you all knew about it as well. I had intended to interview winemaker William Allen for this piece, but unfortunately, life went a little cray-cray and I was unable to do so. Thankfully I have known William for a little over a year now and have been able to talk with him on multiple occasions so I will just go on what I already know about Two Shepherds. Two Shepherds, based in Santa Rosa, CA came on the scene with its first vintage in 2010 and if there was a “rookie of the year” award for wine, I would cast my vote for Two Shepherds. William Allen, creator of the influential wine blog Simple Hedonisms, along with his girlfriend Michelle, created Two Shepherds with 175 cases in 2010 and quickly found the demand to be huge. With a focus on unique Rhone wines, Two Shepherds produces a couple single varietal wines but believes that these Rhone wines truly shine as blends, which brings me to my profile of the 2010 MRV. A blend of Marsanne (47%), Rousanne (47%) and Viognier (6%), this wine is one of my favorites from Two Shepherds. The grapes come from Saralee's Vineyard in the Russian River Valley. On the first sniff I detected aromas of both orange and lemon citrus. After putting the wine down for a couple minutes I sniffed again and got a little bit of pear. Just like the nose, the flavors of the MRV changed over time, which is something I love in wine. When each sip is just a little different it prohibits complacency and keeps you on your toes about what you will taste next. The first taste of the MRV started with some more citrus and lemongrass, followed by subtle notes of sweet honey. The acid in the wine showed on the finish as I was left with this beautiful crispness in my mouth. To be honest, I think I over-chilled this wine a little. However, this turned out to be a good thing because I was able to really notice the mouth-feel and body of the wine change as it came to the proper temperature. Even now the wine is still evolving in my glass, emphasizing the complexity of this white wine. Does Pink Count? Tranche Rose. As Managing Editor of WestToast, I take certain...ahem...liberties when conducting wine business. Featuring a Rose for White Wine Month is one of those liberties because I drink Rose even less than white wine, this selection is delicious, and I want to. Josh Logic: White wine = summer wine; summer wine = Rose. Rose = White Wine Month. Like a back alley drug deal, I picked a bottle of the Tranche Cellars 2010 Pink Pape Dry Rose through a friend of a friend after it had been sold out. It was an insider deal, and I can't resist an insider deal. Despite not being overly fond of most rose style wine, I was assured that this particular wine was worth its weight in gold, so I went for it. Produced out of the Blue Mountain Estate Vineyard in the Walla Walla Valley, Tranche pays homage towards Southern Rhone Culture with this Rhone-styled dry Rose. Whole bunch pressing and low temperature fermentation led to 5 months of aging on lees before racking and bottling. As I poured the wine into the glass, the light pink color popped out at me. Frankly the color reminded me of a super cheap rose that I had a few times when I was younger; the winemaker describes it as salmon -- an adjective I find much more fitting for this classy version of a rose. A slightly aromatic and floral nose enticed me into my first glass, and upon taking a sip I found the wine to be a bit soft at the onset. Onset being the key term, because as the wine progressed through my palate I got a punch of wonderful, delicious fruit. It was a flavor explosion; surprising and delicious. With an acidic tang on the finish, I found the dryness of this wine created a much appreciated crisp, clean, and refreshing sensation. I was pleased. Then, my glass was empty. Seriously, for a guy who isn't into Rose, this is one that is worth every penny with all of the complexity of a nice red. Not quite white, not quite red, but perfect for White Wine Month. While the 2010 vintage is sold out, rumor has it the 2011 is coming soon. At around 168 cases of production, you better act fast. Because Winter Beer Month was such a hit, it only made sense for us to do another month-long series. Every now and then, I take a peek at our analytics to see what you, our readers, actually enjoy on the site. To no surprise, most of you are interested in our wine coverage. It's what put us on the map and arguably what we do best. But what would we want to dedicate an entire month to? Easy, white wine! Why white wine and why in April? Well, for one we rarely ever write about white wine. It's so easy to get wrapped up in the next big red that we often forget about its pigment-challeneged brethren. Additionally, at some point the weather will sooner or later not be so crappy. What do we usually reach for on warmer days to really hit the spot? White wine. When I think white wine, the very first thing that pops into my head is Willamette Valley Vineyards' Pinot Gris. Year after year it is one of the best pinot gris out there and has a huge distribution. Willamette Valley Vineyards even holds a huge crab and chowder festival every year in what is clearly a front for selling more pinot gris. Long time readers will remember I even wrote a Greek-style epic about said event. I've tried each annual vintage for the last few years and they are often consistent, but this will be my first time trying their 2009 varietal. You'll also notice from the above photo that the label looks a bit different. Willamette Valley Vineyards will produce custom labels for special occasions and this bottle represents nothing less than that. Josh, being the the best damn Managing Editor on this site, had these made to commemorate WestToast.com's launch last year. Let's get to drinking! The initial aroma is everything one would expect from a Willamette Valley Pinot Gris. Plenty of crisp, green apple with a small hue of pear greet you as you raise the glass to your mouth. Your tastebuds won't be disappointed as those exact flavors hit your palette in that order, with just a bit of honeydew at the end. What begins initially as tart eventually dissipates into a pleasant, subdued version of buttery green apple. In a sense it first comes off as one dimensional, but that is quickly forgiven as it makes you fall in love with that dimension. This Pinot Gris is wonderful by itself, but would also be great paired with cheese, chicken, white fish, crab, and even spicier Asian dishes. It's also not a very intimidating wine, so it should be enjoyed by a broad range of people and would be a great addition to any social function. If you want to start stocking up for warmer weather or just want a solid pinot gris for your rack, you can't go wrong picking this one up. I also want to remind everybody how great some white wines can be. It's really easy to forget that when you're surrounded by incredible reds, but don't underestimate the whites. It was Friday night, and I had gone to yoga, played an hour of racquetball, and eaten myself silly on beef brisket. The week had been a mellow one - spring break working on a college campus = quiet to actually get things done. I was looking forward to a weekend of gardening, hiking, making mead, and playing bluegrass music. Pretty much the world was as right for me as it could have ever been (I suppose cycling could have been in there too). Wanting a good brew, we hit up Les Caves Bier and Kitchen (yeah, I come here often) 'cuz I had a serious yen for some sour beer. I think I needed something to cut through the amazingness of greasy meat and dark barbecue sauces. 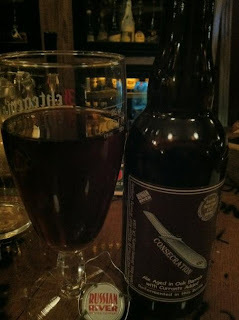 I found just the beer in Consecration by Russian River Brewing Company in Santa Rosa, CA. This dark ale was aged in Cabernet Sauvignon barrels with currants. I enjoyed the deep maroon-red color and the low levels of effervescent carbonation. The nose was sour, tart, with hints of prune, vinegar and hops. Greg noted that it smelled almost like a liqueur, to which I would have to agree. The aroma was very much like a tart cordial. The flavor was sour and rounded with currant to start, it moved into earthy, almost fungal flavors at the middle that were light over the top of blackberry and Cabernet. The finish was tart with the oak and some hops coming through. I really loved the complexity of this beer - so many sours seem to be flat with the sour being the most dominant flavor. Here the sourness complimented the rest of the flavor, rounding it out to create a wonderful drinking experience. I also found the bottle to be quite unique - the heaviest beer bottle I've ever held. Even when empty it felt full. That thing could be used as a blunt weapon to ward off attackers! Upon investigation of the Russian River website, I found they also have a sour beer aged in Pinot Noir barrels called "Supplication." Anyone want to get this for me for my birthday coming up??? Last week I was able to experience my first, and hopefully not my last Rhone Rangers tasting event. I was originally set to just cover the Grand Tasting on Sunday but after hosting a ticket contest for the event, I was awarded a ticket to the “Rare Wines, Come Taste the Unusual” seminar on Saturday. One of the things I love about Rhone wines is their uniqueness and the fun winemakers are having with them right now, so being able to taste rare wines was a real treat. The seminar featured six different wines and the panel, moderated by Jon Bonne’, was comprised of the winemakers. I had never experienced a Picpoul Blanc before so was really excited to start off the day with this wine. And to be from Tablas Creek just seemed right. I noticed a bright aroma of pineapple and other citrus notes on the nose. Those flavors were consistent when I tasted the wine. It had a very pleasant acidity and finished with some lemon citrus. Two Shepherds is the new label from fellow wine blogger William Allen. I have had this wine before but was no less excited to taste it again. I love 100% Grenache Blanc and William knows how to let the grape to shine. I love the citrus notes in this wine but knowing William and his love for wine makes this even better. I know the passion and work he puts in to create his wine and I believe that is wine should be about. I am clearly not the only one who loves Two Shepherds because they had a crowd at their table the entire time during the Grand Tasting. I spoke with many event-goers who put this wine as one of their favorites of the day. To be honest, I had never heard of Mondeuse Noire before this event. Turns out, it isn’t technically a Rhone varietal but is described as a close relative of Syrah. I found it to have a bit more body than a Syrah but similar in the notes of pepper. Based in Los Olivos, CA I spent quite a bit of time talking with winemaker Larry Schaffer. He chose to focus on Rhones because they are “underdog grapes” and Larry has always rooted for the underdog. I really enjoyed his 2010 Viognier because it seemed much more approachable than some other Viogniers I have tasted. It maintained the expected floral aromas and fruit on the palate, but the acidity balanced it out, making it very food friendly. Located in Placerville, I tasted the Counoise from Holly’s Hill at the Saturday seminar. I have come to enjoy Counoise as a single varietal wine and Holly’s Hill was exceptional. I detected a nose of dark cherry with bright flavors of cranberry and a hint of spice. I hope that Counoise continues to be recognized as more than a blending grape because I find it to be a wine that could have some wide appeal if given the chance. Based in Paso Robles, Jada was pouring three wines at the tasting. I only tasted the reds because the “XCV” white blend wasn’t chilled enough. While both were great, I was partial to the 2009 Hell’s Kitchen red blend. A blend of Grenache, Syrah, Mourvedre, and Tannat, it was a full-bodied red wine with lots of red fruit and some slight hints of coffee. The Tannat added the tannins to the wine while still allowing the fruit of the GSM blend to be the star. Okay, I must confess I am familiar with Greg Baiocchi and his wines after meeting him at Grenache Day last year, but I still needed to stop by and say hello. He was pouring his two Grenache/Syrah blends and a rose. Entre Nous is 90% Grenache and 10% Syrah and Sprezzatura is just the opposite. They are both higher in alcohol at mid 16% abv but one of the things I love about these wines is that you would never guess that when you taste them. Wines that high in abv often taste like nothing but alcohol but Greg still manages to get the fruit to stand up and be noticed. If you see Baiocchi at an event, be sure to stop by. So I guess that is it. Rhone Rangers put on a fantastic event and it truly was a “celebration of American Rhones.” The event was well organized and with so many wineries it was easy to find places I knew I loved and then also find new places to experience. I am already putting together a summer trip down to Paso Robles to continue exploring this region that is known so well for their American Rhones. If you haven’t tried some of the more rare Rhone wines like Rousanne, Marsanne, Carignane, Counoise, I urge you to give them a chance. As I believe David Gates of Ridge Vineyards said during the Rare Rhone tasting, “there is nothing wrong with the other wines like Cabernet and Merlot, but there is so much more.” So go ahead and get your Rhone on!